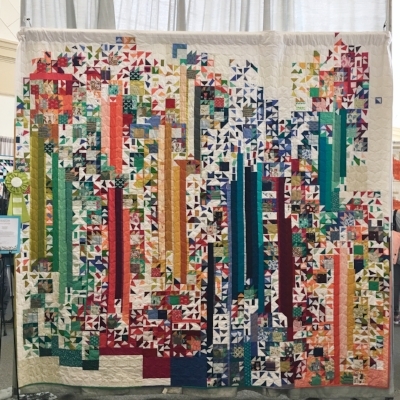 It's high time I wrote about QuiltCon, don't you think?! Unfortunately, I didn't spend as much time with the quilts this year, so I don't know if my analysis will be as in-depth, but I have lots to report nonetheless. First, after introducing myself and Quilts for Cure to Michael Miller at QuiltCon in Savannah last year, I was over.the.moon. to be working with them this year. We made 9 quilts for kids with cancer and are hoping for even more next year, and the #QuiltersVsCancerGiveaway raised over $700 for Quilts for Cure! THANK YOU, Michael Miller and to all of you!! On the whole, I think the whole Modern Quilting Movement is maturing. I especially love the increase of free motion quilting and increased use of prints since those are both near and dear to my heart. I saw noticeable growth in the free motion quilting, small quilts, and appliqué categories. Well done, everyone!! Thanks and love to everyone I was honored to meet at the show as well as to all of you who joined me for our little #QuiltConFromHome video tour! If you are interested in learn more about free motion quilting, I'd love it if you joined me for my FREE online workshop, Intro to FMQ. Learn more and sign up by clicking the button below!